Scheid Family Wines - Blog - Master Sommelier Rates 11 Wines 4+ Stars! Master Sommelier Rates 12 Wines 4+ Stars! 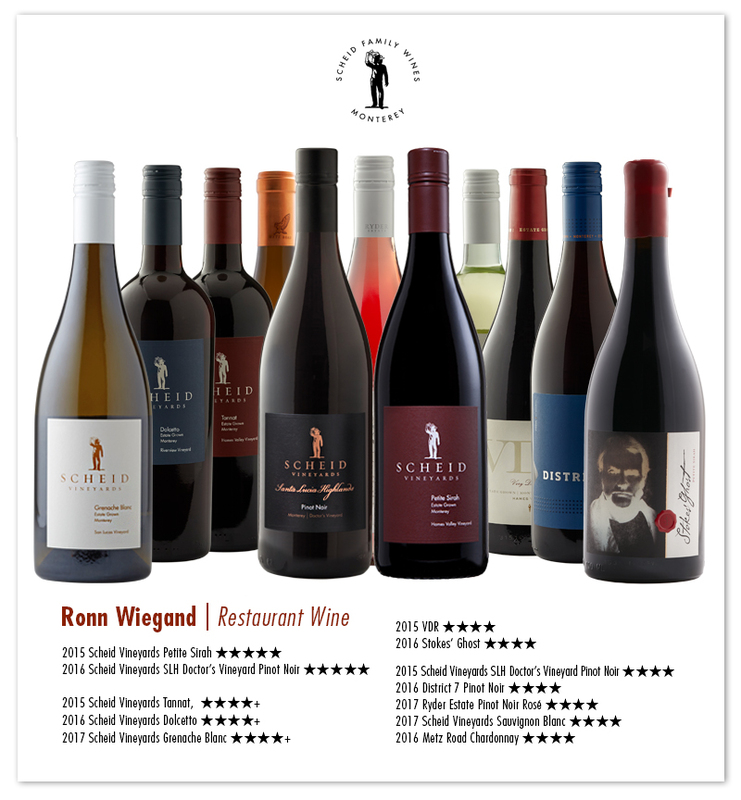 Scheid Family Wines garnered 4+ stars for 12 wines across six brands from Master Sommelier, Ronn Wiegand! "The 2016 is exceptional: quite rich in flavor, full bodied, and complex, with fine character, light oakiness, good balance, and a very long finish." "The Hames Valley Petite Sirah is exceptional: an ultra-ripe, full bodied, intensely flavored wine that is fleshy in texture, balanced, and very long and mildly tannic on the finish." "The 2017 is delicious: full bodied, supple, and rich; a wine with subtle, delicate fruitiness." "The Tannat is a very impressive wine: fleshy, rich, and oaky, it is full bodied and quite powerful on the palate." "The Dolcetto is excellent: red-purple in color, distinctly flavored, well balanced, and medium long on the finish." "Very fine Sauvignon in a fairly delicate style. It is full bodied, crisp, long on the palate, moderately intense in flavor, and spicy and lingering on the finish." "The 2015 is in a ripe, complex style. It is very supple in texture, intensely flavored, and balanced, with a very long finish." "Very fruity in flavor, supple in texture, and full bodied, with cherry, strawberry, and herb aromas/flavors, and a medium length finish." "An excellent Chardonnay: supple in texture, medium rich, and complex in flavor." "This is a distinctly flavored Pinot Noir, with supple texture, ripe fruitiness, a hint of complexity, and a medium long finish." "Very Dark Red is exactly this: very deeply colored, intensely flavored, and full bodied; a concentrated wine with a powerful, long, lightly woody finish." "Concentrated and very ripely flavored; a full bodied, fairly powerful wine, with blackberry jam, plum, cedar, and oak aromas/flavors, and a toasty, tannic finish."